Stop the Motor Avenue Ticket Trap! Do you get stuck in northbound traffic on Motor every morning? Have you received a ticket for making a northbound turn onto Motor from National? Are you losing business because your customers can't access your store? Can't get to your favorite local business? Is traffic being diverted to your neighborhood? CALL AND EMAIL YOUR ELECTED OFFICIALS NOW! "I live and work in the Motor Avenue/Palms area and I continuously get stuck in northbound traffic. Our community is tired of receiving tickets for making right or left turns onto Motor Avenue. The local businesses are losing revenue because of the traffic restriction and I want action to be taken immediately. I want you to remove the traffic restrictions at National Boulevard and Motor Avenue." ﻿Sign our petition here and share your traffic experience with us using the form below! The Community is Tired of the Traffic on Motor Avenue! Our community members are getting dozens of tickets every day. Sometimes there are three or four police cars pulling over multiple cars, making it appear as if a serious crime has occurred and scaring people away from the area. The police cars also block much of the street parking, even doing some of their training there, often reaching their ticket quota for the month just at this intersection. Because of this, our local businesses are losing money every day. The Motor Avenue driveway into the Barbri shopping center is the only entrance to the businesses located there, such as CompuTech and Printex, whose customers can't get to them until after 10am. These businesses, a bakery, printer, computer repair, and auto repair, all have customers who want to reach them in the morning. When their clients get pulled over while trying to patronize their business, it discourages them from coming back. In order to offset this, CompuTech gives a $90 discount to any client who received a ticket while trying to come to their store. Needless to say, this is cutting into their profits, and last year alone they spent $1800 on these "justice credits." In these hard times, we cannot do things like this to businesses and expect them to be successful. 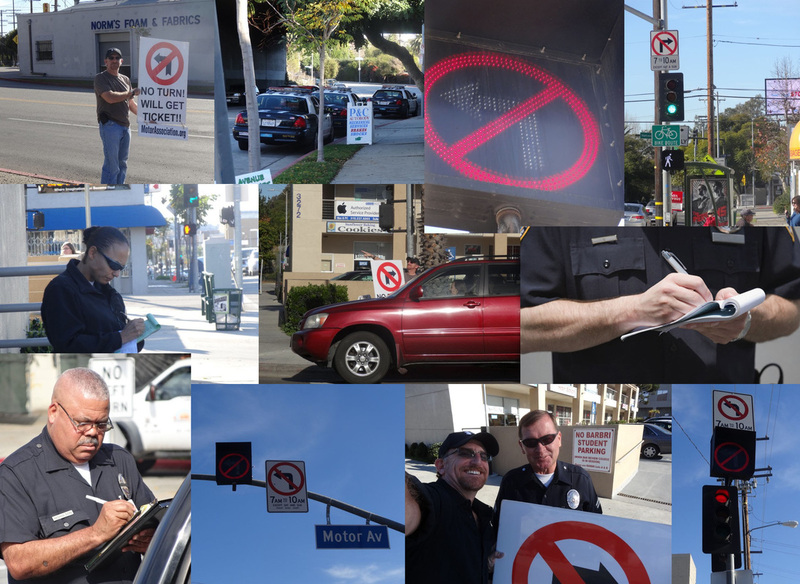 As a short-term solution, our members regularly go out to the corner and wave a big sign warning people not to make the illegal turn onto Motor Avenue. We help many people avoid a ticket, but some don't notice or turn anyway as they are confused. We NEED a more permanent solution to this problem. The Motor Avenue Improvement Association is working with several other neighborhood and homeowners' associations in the area to remove or change the traffic calming measures that cause a bottleneck at the Motor/National intersection and impede access to local businesses. 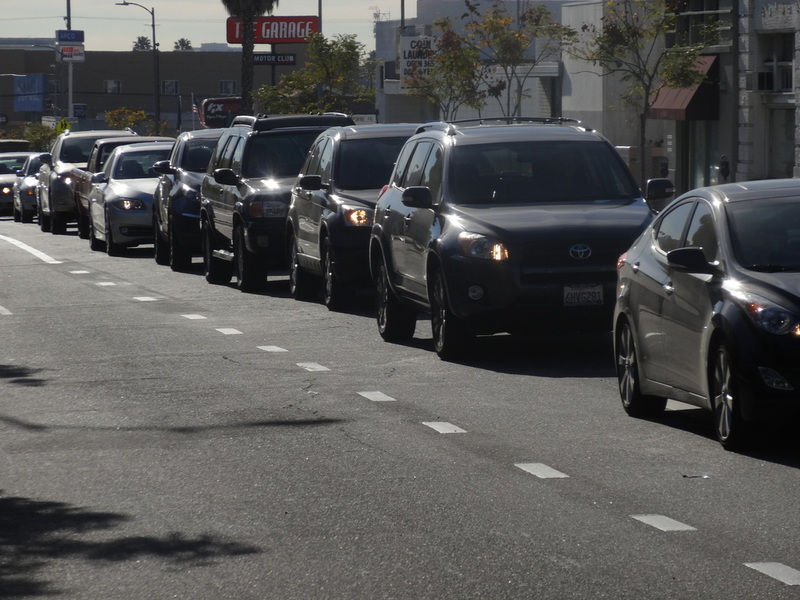 These measures, part of the Century City Neighborhood Traffic Management Project(CCNTMP), have become counter-productive to their original goals, and now hinder businesses and residents alike. 1. Remove items of the CCNTMP associated with setting a 600-vehicle per hour cap during peak hours specifically at the Motor Avenue and National Boulevard intersection. 2. Instruct LADOT to adjust all signal timing that has been altered at Motor and National back to its original condition. 3. Remove restrictions for northbound turns from National onto Motor. 1. LA TIMES Front Page Intersection in Palms produces lots of tickets — and angerLimits on turns during morning rush at a Palms intersection result in lots of traffic tickets — and unhappy drivers and merchants. 2. 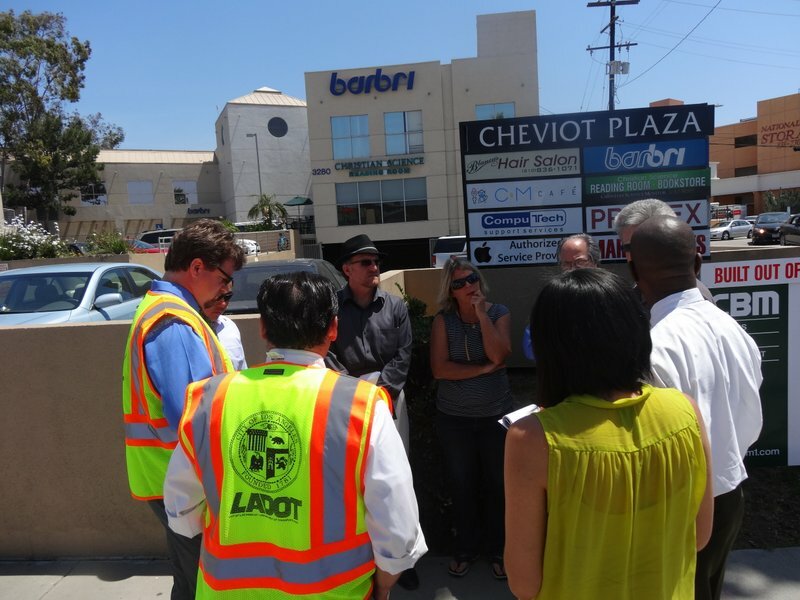 LA TIMES NOW Palms merchants demand fix for alleged ticket trap on National Blvd. Activists on Motor Avenue heightened their call on city officials Wednesday to fix what they believe is a ticket trap at a congested intersection in their Palms neighborhood. Small Business Owners Say Palms Neighborhood 'Ticket Trap' is Costing Customers and Causing Traffic Advocates against turning restrictions on National Boulevard and Motor Avenue are calling upon city council members to oust the constraints. President of the Motor Avenue Improvement Association Lee Wallach spoke with Today in LA on Thursday, Aug. 15, 2013 and said the "no turn" rules from 7 a.m. to 10 a.m. forced one hairdresser to close up shop. 4. FOX LA MOTOR AVE TICKET TRAP? The no turning signs may seem small but they have big consequences at the intersection of National and Motor Avenue. Neighborhood advocates say its a ticket trap and deter customers from local businesses in the area. A busy Westside intersection has become a battleground for local motorists and business owners losing money over what they say is an excessive number of traffic restrictions. KNX 1070′s Pete Demetriou reports the Motor Avenue Improvement Association is calling on City Councilman Paul Koretz to address the alleged “ticket trap” at Motor Avenue and National Boulevard in the city of Palms, where community members claim to get dozens of traffic citations every day. Below is a sound clip from the story. MAIA and local business representatives met with the Department of Transportation's (DOT) Executive Officer of Operations Selwyn Hollins and additional staff to discuss the removal of traffic mitigations on Motor and National. DOT assured us that these mitigations could easily be removed. All they require is a motion put through the council office. We've also lost another business on Motor due in part to the inability of their customers to gain access to them in the mornings. Is the comfort of a few influential and wealthy residents on Motor and in Cheviot Hills more important than a family's livelihood? Meet Margarita (picture above) who is losing her business at the corner of Motor and National. She is not getting enough business and many of her clients have received tickets in the morning or can't figure out how to get to her location. We are not concerned that there were previous agreements or motions made. There was no study done by DOT before the mitigations were put in place and there are clear negative impacts that need to be addressed per the previous motion. Now, we are pressuring Councilman Paul Koretz and the council office more than ever to remove these traffic calming restrictions. This is all in Councilman Koretz's hands. Councilman Koretz meeting with local stakeholders regarding this issue.